Engineers work high above the road as a train from Kyle passes works on the A890 Stromeferry bypass. 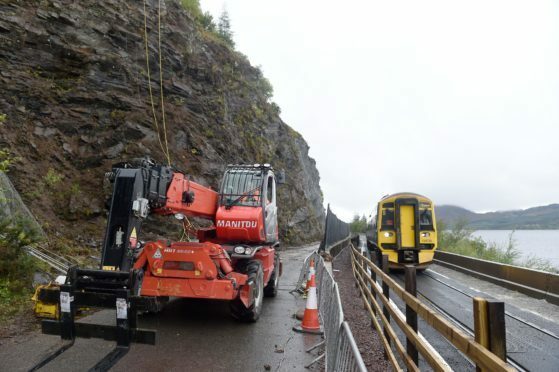 The dangers run on a daily basis by travellers on the A890 Stromeferry Bypass have been highlighted in this year’s inspection of the sheer rock face on the landward side of the road and railway line to Kyle of Lochalsh. Furious Wester Ross councillors are demanding action by Highland Council to tackle the problem once and for all. Geologists from AECOM Engineering inspected the area in detail last April, using ropes to scale the rock faces. They have identified four slopes as ‘very high risk’ of rock slip, with a further seven described as high risk, and 10 as moderate risk. These are in addition to the section of rock face which has been undergoing stabilisation work since September, involving considerable road and rail disruption. Councillor Derek Macleod said: “Everybody in the area has been aware of the risk of rock falls over many years and the expression ‘there but for the grace of God’ applies. Mr Macleod said the preferred rerouting was via a bridge at Strome and a bypass behind the village of Lochcarron. Councillor Ian Cockburn demanded ‘action not words’ from Highland Council. He said: “They’ve got to show the community they’re serious about this. “School children go on that road every day of the week. The two councillors will raise their concerns at the council’s Environment, Development and Infrastructure committee (EDI).